What is anti-Semitism today, two generation after the Holocaust? In his continuing exploration of modern Israeli life, director Yoav Shamir (Checkpoint, Flipping Out) travels the world in search of the most modern manifestations of the "oldest hatred" and comes up with some startling answers. In this irreverent quest, he follows American Jewish leaders to the capitals of Europe as they warn government officials of the growing threat of anti-Semitism, and tacks onto a class of Israeli high school students on a pilgrimage to Auschwitz. On his way Shamir meets controversial historian Norman Finkelstein who offers his unpopular views on the manner in which anti-Semitism is being used by the Jewish community and especially by Israel for political gain. He also joins scholars Stephen M. Walt and John J. Mearsheimer while they give a lecture in Israel following the release of their book, "The Israel Lobby and U.S. Foreign Policy". which explores disproportionate influence the Israel lobby enjoys in Washington. Shamir visits Yad Vashem, the Holocaust Memorial Museum in Jerusalem and a 'must-stop' for all world leaders visiting Israel. Finally, he drops by the house of his grandmother who is pleased to offer her own insights on the issue, declaring that she is the "real Jew." 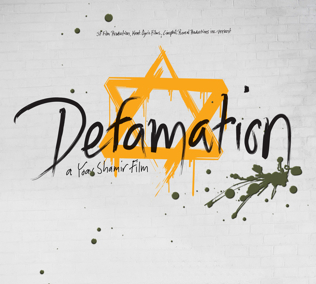 Defamation questions our perceptions and our terminology when an event proclaimed by some as anti-Semitic is described by others as legitimate criticism of Israel's government policies. 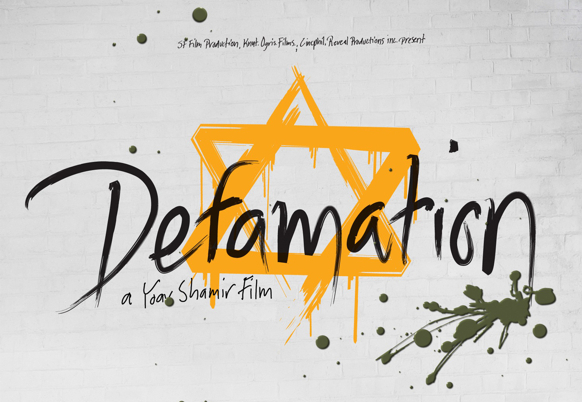 The film explores the boundaries between anti-Zionism: rejecting the notion of a Jewish State, and anti-Semitism: rejecting Jews. It poses the questions: Is the former being used to excuse the latter? And is there a difference between today's anti-Semitism and plain old racism that is affecting all minorities? Opinions often differ and tempers sometimes flare, but in Defamation we find that one thing is certain - only by understanding their response to anti-Semitism can we really appreciate how Jews today, especially modern Israelis, respond to the world around them, in New York and in Moscow, in Gaza and in Tel Aviv. Yoav Shamir was born in Tel-Aviv in November 1970. He completed his BA in History and Philosophy at Tel Aviv University, and an MFA in Cinema, from which he graduated with honors. 2003- "Checkpoint" – 80 min. documentary. Won the first award in IDFA, Toronto, San Francisco, Munich, Madrid, Barcelona, Rome, Belgrade, Rio de Janeiro and more. Received over 20 awards, and screened in over 120 international film festivals. 2005-"5 days"- 94 min. documentary. Participated in Sundance, IDFA, Edinburgh, Melbourne, Gothenburg, Seoul and altogether, around 40 international film festivals- in which won several awards. 2007-"Flipping Out"- 83 min. documentary. Berlinale film festival 2008- Forum. Thessaloniki, Buenos Aires, Krakow, San Francisco, and about 40 more international Film Festivals.